Millard Sheets (1907 - 1989) was a California painter, muralist and teacher. He was an important figure in the Southern California art scene for over 60 years. Millard was born in Pomona, California. Sheets employed a number of media ... including watercolor and oil and was a muralist in fresco and tile. By the early 1930s, he was on his way to national recognition as an American artist. He exhibited works in Paris, New York, Pittsburgh, Chicago, San Francisco, Washington D.C. and many other U.S. cities. He was recognized as the leading figure and driving force behind the California Style watercolor movement. 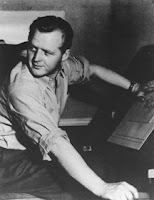 Sheets was a wartime artist correspondent for Life magazine in 1943, 1944 and traveled to China, Burma and India. His worldwide travel assignments (also Turkey, Russia, Hawaii) influenced his art in many ways. Sheets was director of art at Scripps College and Claremont Graduate School in Claremont, California. While in Southern California, he was influential in developing the art scene. He participated in Franklin Roosevelt's Public Works of Art program as a member of the committee that directed the program's regional activities. 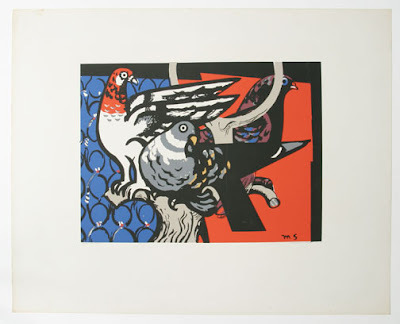 Mignonne is currently offering a framed print, "Three Gay Birds", by Millard Sheets. The print is approximately 23"X 28" and is nearly identical to the one pictured below. The print on offer at Mignonne has yellow tones versus the red depicted in the image below. Call us at the store or use the contact feature on this blog with inquiries.